Did you know that the NCVA has its own e-book developed to help restaurant owners offer vegan items on their menus? The e-book, written by the NCVA’s past president Pamela Tourigny, is called “Beyond Veggies: A Guide for Introducing Plant-Based Meals at Your Food Establishment”. Restaurant owners looking to serve vegan foods at their restaurants can download the guide for FREE from our website (see below). Additionally, individuals hoping to encourage more of their local eateries to serve vegan food can print off the guide and present it to their local restaurant owners. Basically, anyone who wants the guide can have it, free of charge! It would be great to know who is downloading the guide and why, so we ask that interested people answer a few quick questions using the form below before getting access to the download links. Thanks! Note: If you are interested in volunteering with the NCVA to help us reach out to restaurants and discuss the guide with restaurant owners, feel free to contact us for more information! 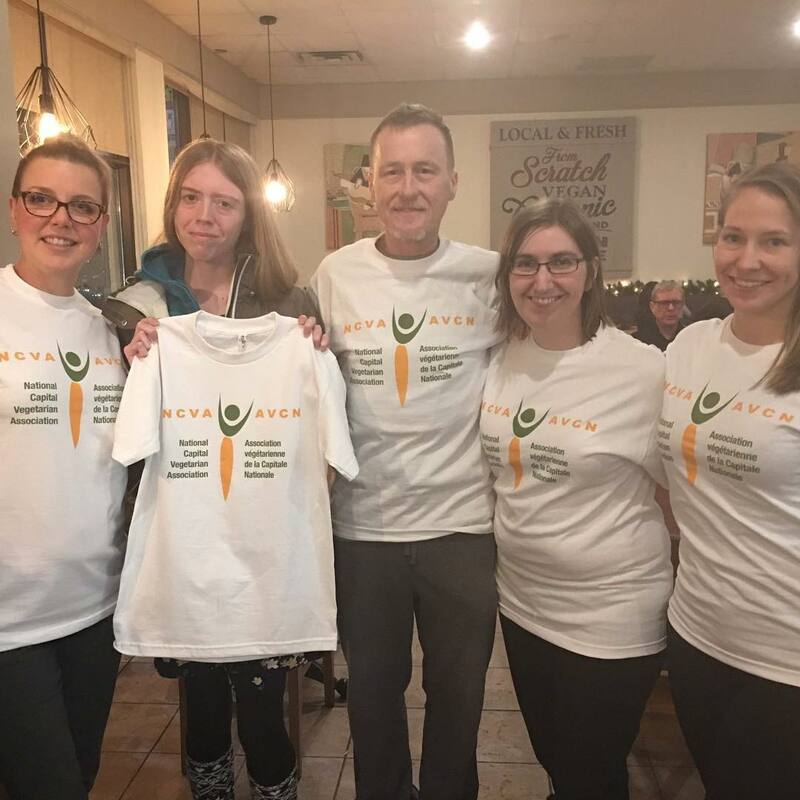 This Veganuary, Get a T-shirt With Your NCVA Membership! Veganuary starts today, and here at the NCVA we have a special offer for anyone who buys a membership. From now until the end of January, the NCVA will be selling newly-printed NCVA t-shirts at a discount (for only $5) to current and new members. If you aren’t a member yet, you can buy a membership and get your t-shirt—all for only $25! (A membership on its own costs $20.) If you’re already a member, you can get the t-shirt for only $5. NCVA members can receive discounts on vegan food at various local vegan-friendly businesses, as well as a discount on attending NCVA potlucks. Membership is open to anyone, and there are no responsibilities associated with membership (although members are welcome to attend and vote in our Annual General Meeting and even run for the Board of Directors, if they so wish!). To buy a membership and T-shirt, please click here to go to PayPal, or, if you are already a member, to buy a t-shirt only, please click here, instead. Please note that only current NCVA members can get the T-shirt only. Your T-shirt and membership card will be delivered to your house if you live in Ottawa (or you can pick it up in Ottawa), for free! If you live outside of Ottawa and are unable to pick it up, there is an additional $5 shipping fee. To learn about Veganuary, and why and how to go vegan, you can check out their website at www.veganuary.com.